University of Utah Press, 9781607812050, 76pp. Set against the sprawling backdrop of Los Angeles, Night Radio excavates the kidnapping and sexual assault of a young girl and the resulting layers of trauma exacted upon her and her family. Working within the paradox of the insufficiency of language and the necessity of expression, these poems elevate overwhelming experiences into near-mythic narrative. Night Radio’s attempt through art to “make sense” of a seemingly senseless world raises troubling and timeless questions about the value, necessity, and futility of the aesthetic act. At the heart of the book is a journey toward reconciliation—wherein one discovers an abiding though hard-won faith within a complex, overwhelming, and, at times, frightening universe. Finalist for the Kate Tufts Discovery Award. Kim Young teaches creative writing and composition at Moorpark College and edits Chaparral, an online journal featuring poetry from Southern California. Her poems have appeared in The Los Angeles Review, MiPOesias, Pebble Lake Review, and other journals. She holds an MA from California State University Northridge and an MFA from Bennington College, where she received a Jane Kenyon Scholarship in poetry. She lives in Los Angeles with her husband and daughter. "The poems are so moving, I feel as if I am suffering as much as any of the characters. This really is an excellent book of poetry. Her story is heartbreaking." 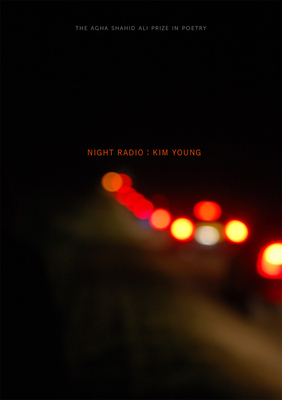 "Kim Young's Night Radio works much as its subject matter does: worming its way into your ear like an urban legend, it lodges somewhere behind your eyes and works itself out in pieces, at night, almost against your will. [Her] debut collection feels real, dark, and deep. In the face of horrible and irrational deeds, we are still open to communication, and the book reminds us of that in startling and lyric ways."